Choosing the right flooring for your home is a dedicated effort. The selection seems endless when you look at all the brands and manufacturers available today. Between wood floors, imitation wood flooring, laminates, and more, you have hundreds of different floor types, stains, qualities, durability, and finishes. Your local home store will only have a limited number of flooring options to choose from. However, shopping online allows you to find exactly the right type of flooring that you're looking for. You can shop for a variety of flooring types from the comfort of your own home - in the flooring color you prefer, and often at a price less than that local store. Simple Floors sells floor covering products with the exception of carpeting. Their web site is rather difficult to use and they do not sell a wide variety of brands and manufacturers. In fact, they sell none of the more major brand names. Selection. You want to choose your flooring from the widest selection of brands and styles available, so you can find exactly what you're looking for. Return Policy. If your flooring order doesn't meet your needs, can you return the product for a full refund? Prices. Finding a store that offers competitive pricing is going to help you maintain your project budget. How do the flooring prices compare between stores? 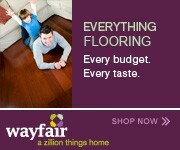 TopConsumerReviews.com has reviewed and ranked the best flooring stores available today. We hope this information helps you find the right flooring for your home!